The United Kingdom general election takes place next week, with current polling predicting no clear majority in the House of Commons for any party. One of the most well-known concepts in political science is Duverger’s Law, which states that two parties will dominate under ‘first past the post’ systems, such as that used in the UK. This concept held for British elections until the recent rise of smaller parties and the decline of the traditionally largest parties, Labour and the Conservatives. Patrick Dunleavy argues that the decline of two-party politics in the UK sounds the death knell for Duverger’s Law, with Britain now having a multi-party system akin to that which exists in other western European countries. The UK’s current general election looks certain to put another nail in the coffin of the most famous proposition in political science – Duverger’s Law, first formulated in the 1950s. In its modern testable form (after Andrew Cox), the Law says that in each local constituency the number of (substantial) parties under FPTP should equal one plus the number of seats being contested (which in this system is 1), so = 2. A highly nationalised political system, like Britain, should also show two parties dominating nationally, although maybe with smaller regional competitors in some cases – as with small special parties in Scotland, Wales, and Northern Ireland. The top two parties should accordingly be able to form single-party majority governments. Yet in the 2015 UK general election a five-year coalition Conservative-Liberal Democrat government has just expired. 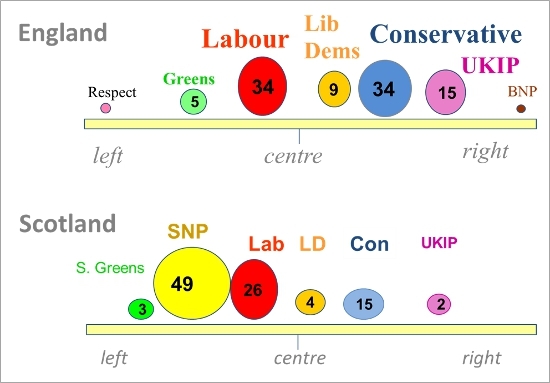 And competition is taking place within party systems that show multiple (big) parties competing in both England and Wales, and Scotland – as Figure 1 shows. The different blobs here show where each party stands on a left/right ideology scale. And the size of the blob shows how generally significant a party is in UK political terms (including winning seats in the European and Scottish parliaments, or the London Assembly). Finally, the numbers inside each blob show that party’s current general election support, averaged across the six most recent opinion polls. So Britain now is pretty much exactly like every other multi-party system across western Europe. In England two old governing parties on the centre-right and centre-left are continuing with flagging support, separated by a small liberal party. The Liberal Democrats’ vote has shrunk dramatically from 23 per cent in 2010, as the cost of supporting a Tory dominated government. The UK Independence Party is a pretty standard ‘anti-foreigner’ party; of the kind present in the European right everywhere now. Its appeal is fuelled by scare stories of immigrant influxes and anti-EU rhetoric. The Greens on the left are still battling to make a mark in the UK, but run third amongst young people. Turning to Scotland, the Scottish National Party (which has a majority government in the Edinburgh Parliament) is riding high on last year’s referendum wave – when 9 out of every 20 people voted to leave the UK. The SNP’s surge has pushed Labour (the traditional hegemon north of the border) to a poor second, and marginalised the other unionist parties. On their current form, the SNP might yet win almost every seat in Scotland, unless some Tory and Liberal Democrat voters can bring themselves to back Labour as a tactical vote for unionism. But the key test of Duverger’s Law comes at the local seats level. Figure 2 shows the predicted seats outcomes across Great Britain next week. Each black dot is a single constituency result. On the bottom axis, seats where the Conservatives are in the lead over Labour are shown on the right hand side, and seats where Labour leads the Tories on the left. The vertical axis shows the combined proportion of votes in each locality backing parties running third, fourth or fifth nationally. If Duvergers’s Law was working perfectly in Britain, all the seats should be piled up on the bottom axis of this chart, and completely within either the red or blue triangles – showing seats where either a Labour or a Conservative MP wins with majority support. (Outcomes exactly like this happen at every election in the USA still). But instead, there are no seats close to the bottom axis – almost no UK contests in 2015 will show levels of combined third, fourth and fifth party voting below 20 per cent. 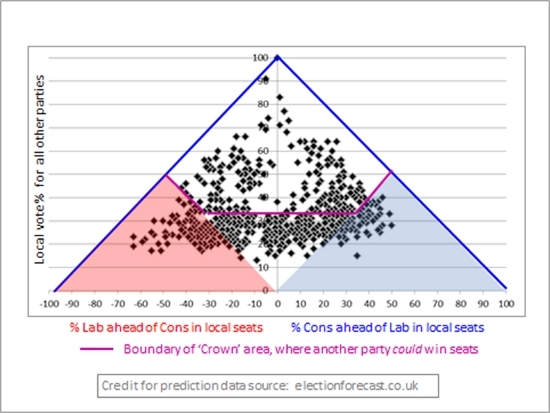 There is also a huge upward spread of seats into the ‘Crown’ area shown, which is where parties running third or fourth nationally can potentially win seats (depending on how fragmented this ‘remainder’ vote is). As a result, very few MPs will have more than 50 per cent local support in 2015, and many of these will actually be in Scotland for the SNP. So the UK’s 2015 general election outcome spells the complete destruction of Duverger’s Law, and in the country which is the locus classicus for the Law. How voters choose may also soon lead to the UK’s moving further towards a new voting system and a new, fixed constitution. All this now depends on whether Ed Miliband can become Prime Minister, or whether David Cameron can cling on in 10 Downing Street. How did the claim ever assume the status of a “Law” amongst rigorous thinkers? Canada has the same vote-counting system of simple plurality in single-member constitutencies, yet lacks a two-party system, and has done for decades. The UK was a 3 party system from the mid-1800s to 1945, and had periods of minority rule and coaltion in the 1970s, 1990s and 2010s. Duverger’s “Law” to me seems like wishful thinking, seized upon by people who object to single-member constituencies or simple plurality voting systems; I don’t understand how it got so widely repeated.